Home > Submissions > 2013 LAUREL, OPENING SOON!! In NINE DAYS, Clash of the Titles opens its doors for submissions to the Laurel. 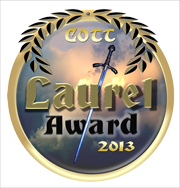 The Laurel is a contest available to any genre of Christian fiction published in 2012. The novels are judged by their audience—readers well-versed in Christian fiction yet not associated with the CBA industry. With a submission fee of only $10, easy electronic submission, a bevy of prizes, and judges devoted to Christian fiction and author encouragement, the Laurel is a contest like no other. But act quick! Slots are limited. To avoid overburdening our volunteer judges, we are limited in the number of submissions we can accept. * All previous COTT champs whose winning novel was published in 2012 have an assured spot (fee waived) in the 2013 Laurel.